This entry was posted in Uncategorized and tagged emotional, Entertainment, handwriting, Inspiration, life, physical, Relationships. Bookmark the permalink. Oh, super cool. I would say I’m and optimist! Mine varies between straight up and down to leaning slightly to the left. The only time my handwriting ever learns to the right is if I’m signing my name. I definitely see a lot of truth to this! Hey Jamie, thanks for playing along. That typically means that you’re a bit reserved but you show yourself as out going. Either way balance is the key and your results indicate that you have that! Thank you again for stopping by. Also, it took me an embarrassingly long time to write that sentence in cursive. lol…there are other indicators. Is your writing large (extrovert) small (introvert). the right slant could mean that you like to appear extroverted but are truly the introvert. There are many other things to take into consideration but this was just a taste. thanks for playing along. My handwriting is usually small, so that would make sense. Pretty interesting, though… I need to try analyzing some other people, haha. 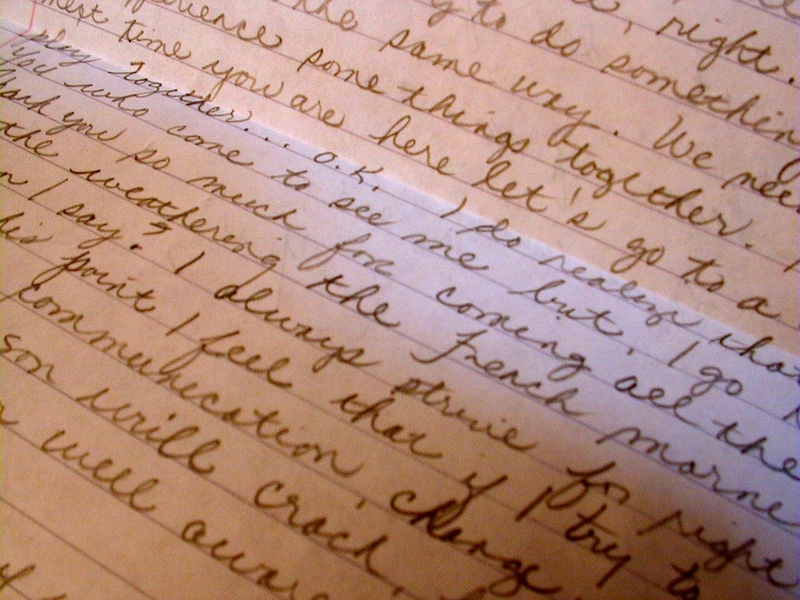 Does handwriting really vary with our mood? Absolutely, you can even change things about yourself by changing your handwriting. Thanks for sharing! I was actually just talking about this the other day with a friend of mine. Mine definitely slants right, but frequently my whole sentences slant downward. I don’t think I’m consistently feeling negative about something? But that’s why you included the words “mostly” and “usually”. Good post. Great piece. My handwriting confuses me so much because it changes so often. At times it is all upper case and then at others it is lower case. Most of the time it is just untidy and it makes me think each of the voices on my head have their own writting style! I thought I would be one way and my handwriting says another thing. An interesting contradiction which is, by the way, how a lot of people describe me. Nice post! I noticed, that my phisical or emotional state has influence on my handwritting. You know, one fine day at a job I didn’t like, I was spending my down time writing. On a slow morning at any restaurant, the hostess doesn’t have much to do considering she doesn’t serve, she doesn’t wait, she doesn’t bus (not in all, but in many places.) So, I was writing; mostly scribbling down notes on people that I found interesting in the place to construct some poetry at a later date. A customer walks in and I put my scratch aside. Little did I know when he was talking with me, asking about a table and how my day was going, he was studying my writing, a graphologist of sorts. I don’t know if I believed everything he said but when he started explaining myself to me without ever knowing me… I was floored. By the way, have you ever read Diary by Chuck Palahniuk? Great read. Thanks for this. Hey Ashley, boy…do I know about the restaurant indrustry…lol. It is funny how we all think that we’re sooo different than everyone else but in actuality, we’re just like everyone else…thanks for stopping by and the book referal! this is interesting…i’ve heard about this before but never knew about the details..nice..
My letters lean to the right, but I don’t think I am physical, but rather emotional. I also consider myself introvert, I am also left-handed, does this mean anything? Absolutely, the right lean is taught however, another way to tell is by the size of the writing. Large(physical) small(emotional). I’m left handed as well that means you’re right brained and you may also be creative..
Bang goes the theory T. Thank you for following my blog. About the handwriting. Mine does slope toward the right but I am an emotional person. I am also a little extrovert. Possibly these things can tell a lot about a person but you cannot always be sure. Anne, thanks for stopping by. The rightward slant was taught, there are many, many other indicators that tell more details. For example Large writing (physical) Small (emotional). This was just a tease of how to tell…thanks again for stopping by! Pretty interesting! It would be interesting if there was some sort of software program that could analyze typing patterns in a similar way. I have a tendency to mis-type, delete, correct certain key combinations automatically. Is this the type of pattern you are talking about? this is really interesting! I never would have guessed. I’m going to make all of my friends try it now. lol…thanks for stopping by…let me know how it goes.. Thank you for wonderful entry and you have a great blog running! This is cool! I was looking through my notebook which has both class notes and a few journal type paragraphs in it…the class notes are up and down and the journal paragraphs have a right slant. I guess I am only intellectual when I have to be? Before I try this I have to ask: What if your hands are crippled as mine are? Will there be any accuracy in analysis except to say it’s bloody awedul? (lol) Handwriting analysis is interesting so I hope you can answer. Thanks! Your physical status will reflect in your writing…there are other determining factors here…large(physical) .. small(emotional)…Thanks for stopping by, I enjoy your work as well. My sweetheart and I just did this exercise together. I wrote, he wrote, then I read the blog for both of us. Both of us produced samples with almost all of the letters vertical (although my lines were horizontal and his go up slightly from left to right). Interesting note: the word “forty-eight” in my sample came at the end of the second of three lines and in the middle of his second of three lines. The letters in the word “forty-eight” are the only letters either of us wrote with a slant. We both slanted them to the right. Coincidence? I believe it. My handwriting is not even consistent. It can also change from any given day. Thanks for posting! It says a lot actually…I’d need to see the writing specifically to tell what it means…thanks for stopping by.. Extremely interesting piece; it seems separating the physicality from the emotional and mental is a mistake; as you point out in your article, human actions are holistic in nature. The handwriting proves that. I don’t think that it is possible to seperate any of the three as we are all three at the sametime. However, we do act on one more so than the other. There is a lot more to this than can be put in a blog but stay tuned there is more coming…thanks for stopping by and commenting.. Interesting. Mine goes mostly straight up with a sometime right lean. Of course most of it is also unreadable except to me! My handwriting tends to lean slightly to the left. And if I write on a white piece of paper (no lines) my handwriting does go up. I think this does describe me in some ways. I’m going to have so much fun checking out other people’s handwriting & seeing what type of people they are. I also remember my teacher saying that if someone has big handwriting they are insecure and don’t have a strong personality. Very interesting post. I’m going to have to consider what this says about me on any given day (my handwriting changes that often). Miss Demure..thanks for stopping by and thanks again for the tips! Joe…thank you so much for your repost…I really appreciate it!!! Now, that’s what I call informative post. Thanks for following me at Lyn Leahz! God bless you! I hope you’ll check out my other site, too! http://PromiseBook.net! Thanks again and have a beautiful, blessed week in Christ Jesus! Thanks for visiting my blog. All the best for your writing! Up. Optimistic. I’ve always loved this stuff, have read a few books on it, forgotten most of it, wish you’d do more of it. Thanks for the fun read. Thank you for dropping by. Typically your handwriting changes according to your mood swings. People will tell you that there’s something wrong with this but they’re wrong. This simply means that you’re probably creative. I would advise that you follow what your teacher says in class and then develop your creativity at other times. As you get older you’ll develop a more consistent style of writing. Bottom line…don’t sweat it. Hope this helped. Also writing in a more consistent manner will help manage your mood swings.